Discussion & info about Chevy Aveo at AveoForum.com (plus Chevy Sonic, Pontiac Wave, Pontiac G3, Suzuki Swift+, Holden Barina). I started this fuel economy project after the Hurricane Katrina-inspired gas price run up, as I have a long commute and, except for a few hybrids, the car companies were busy introducing models with ever poorer gas mileage. What fuel economy does it get? My car is a 1992 Honda Civic CX which I bought new, has an EPA fuel consumption rating of 47 mpg (US) highway / 39 city (5.0/6.0 L/100 km ... 20.0/16.6 km/L ... 56.4/46.8 mpg (Imp. )), and averaged mid 40's when driven "normally". Before Katrina, I had been using hypermiling techniques to get me up to an average in the high 50's, but I had to keep the speed below 55 mph (89 km/h) to achieve it, which can be inconvenient to do on busy highways. About this time I had read Phil Knox's article "Free Fuel Riding on the Wind" in EV World where he talked about using commonplace materials from the local hardware store to lower his truck's drag coefficient (Cd) and improve its gas mileage at highway speeds. Also, having lived in Germany, I was familiar with many of the ultra-low Cd cars designed in Germany during the 1930's. Since it didn't look like the car companies were planning to do anything in the foreseeable future about introducing a small car that would get good fuel economy on the highway, I decided to see what I could do towards improving my existing car's gas mileage. The results of coast down testing are linear out to 90 mph / 145 km/h (it coasts almost as well at 80 mph / 129 km/h as it does at 50 mph / 80 km/h) and the Cd tested out to be 0.17. Using E10 (10% ethanol/gasoline blend) drops these numbers by about 5 mpg. It was averaging mileage in the low 70's until E10 was introduced and is now averaging high 60's (see current fuel economy log). The flip side of the improved mileage is the increased range and I have no problems getting over 800 miles (1,287 km) from my 11 US gallon (41.6 liters / 9.2 Imperial gallon) tank in the summer. This car coasts so well that when I switch from driving this car to a "normal" car, it feels as if I am driving on a road covered with molasses, and that, like a powerboat, you have to keep pouring on the power to maintain headway. By contrast, with this car on a level road it only takes a light touch on the accelerator to maintain speed and it takes only the slightests of downhills to maintain speed in a coast. Even a Prius now feels "draggy" at highway speeds compared to this car. Needless to say, the car gets plenty of strange looks out on the highway and one of my biggest problem while driving out on the highway are the rubberneckers cueing up to stare and take pictures. The biggest one, both in strange looks received and on its effect in improving my gas mileage is the boat tail. This is the tapered back end of my car that resembles the back of an aircraft fuselage. This eliminates the recirculating, low-pressure eddy that forms behind "normal" cars and that act to slow them down. This eddy is also responsible for the dirt that accumulates on a car's backside and allows a closely following car to improve its mileage by drafting. As a result of my boat tail, the back end of my car remains clean and anybody drafting me would gain no mileage benefits. I took advantage when installing the boat tail of extending the interior of my car into the boat tail, so I now have an additional two and half feet of cargo space behind the back seat. The rear glazing still functions as a hatch for access to cargo. The boat tail also provides an additional three feet of crush space in the event I am rear ended and proved itself when I was rear ended by a high speed car. The tail lights are completely LED and the backup lights are two tractor work lights mounted in the underside of the boat tail. The next most visible mods are the wheel well covers. These streamline the sides of the car and as a fringe benefit, keep the sides of the car clean by eliminating the water spray that you see boiling out from the sides of most cars when driving on a wet road. The covers are hinged at the top for tire access and front covers are equipped with rollers that the sides of the tires push against to open it as needed when making a sharp turn. There is a spring at each lower corner that holds the cover closed when not making a turn. The rounded nose lowers my stagnation point to reduce the amount of air passing under the car. It also houses my adjustable grill inlet so I can adjust my cooling air drag to the amount actually needed to cool the engine. Most cars use a one-size-fits-all approach to grill inlet design with a grill opening sized for the worst case cooling scenario. Since the underside of the engine compartment is paneled, I exhaust the radiator air out through the front wheel wells. The rounded nose starts the air moving smoothly up over the front of the hood and over the top of the car. It functions as a two mode bumper; acting as a scoop when I run into deer to redirect the collision energies upwards so the deer are propelled up and over the top of my car. But if I hit something heavier, it also provides about one foot of additional crush space as it crushes back to the car's original bumpers. 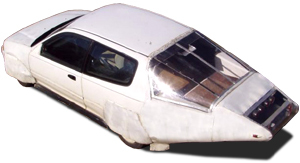 The car's underside is completely paneled so the wind can travel smoothly under the car. This is an area almost totally ignored on most cars (except on some exotic sports cars and luxury cars), since out of sight is out of mind. In addition to drag reduction, additional fringe benefits of the underbody paneling are a reduction in "road noise", much of which is actually generated by wind turbulence under the car, and a clean engine, since mud is no longer being splashed up from below. The wheels have been integrated into an airflow management system that splits the wind to either side of the front wheels, then keeps this divided flow moving smoothly down past the rear wheels where a wheel boat tail allows it to rejoin behind the car. This keeps the air moving linearly under the car with minimum turbulence and greatly reduces the amount of water spray, road salt, or dust kicked up behind my car. Both rear view mirrors on the side of the car have been moved inside the glass to eliminate their contribution to drag and wind noise. There is a small wind deflector in front of the windshield wipers to get them out of the wind flow. All of the small gaps in the body around the doors and between various panels have been filled in to cut their slight contribution to wind drag.